Can You Really Make Money on Etsy? If you are a crafter, then you have no doubt heard of Etsy before. Etsy is home to more than 800,000 shops ran by sellers who make all sorts of things like handmade soaps, clothing, jewelry, music and a lot more. With handmade items in every category imaginable, shoppers can find just about everything they want at Etsy. It’s a great marketplace for crafters to connect with buyers who may be interested in their handmade goods. Etsy was created in 2005, but didn’t really pick up momentum until 2009. That’s when Etsy received $615,000 in funding from investors, which attracted thousands of crafters who made the choice to sell their goods on Etsy’s marketplace. That was then, and this is now. So let's take a look at if you can still make money with Etsy, how much, and how it's done. There are lots of stories of Etsy sellers that are doing well, selling thousands of products, but how can you know for sure? Unless, an Etsy seller is willing to share their results, there’s no real way to know for sure how successful (or unsuccessful) they are. However, one way to tell is to simply visit random Etsy shops and check their sales numbers. If you are considering selling your own handmade items on Etsy, you should visit shops in the category you want to sell in. Each shop hosted on Etsy has information listed so buyers can learn about the shop and its owners, read reviews, and — more importantly — the number of sales the shop has acquired. Here is an example I took from one shop to give you an idea of what to look for. You can see that this shop was created in 2014, and has acquired three-hundred thirty-four sales since then. Once you see how many sales they have, you can look at the price of all their items to come up with an average price. That should give you a pretty good idea how much money they are making. So, if you are curious about Etsy shops in a certain category, just find the best selling shops in that category, then look on the left side of their page for the information. You can surf around Etsy and see lots of shops with thousands upon thousands of sales listed, so I think it’s safe to say that it is possible to make money on Etsy. 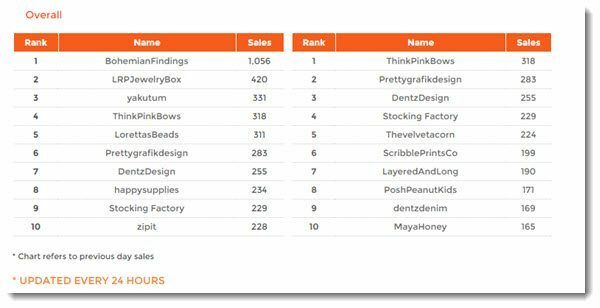 Thanks to CraftCount, a website that pools information about Etsy sales, we are able to see many of the top selling shops on Etsy, according to country, category and date. For our purposes, I wanted to see the overall, top selling Etsy shops for today’s date, (11/11/15) based purely on sales, not category or country. So you can see what I can see, I have included this image. You will notice a shop called BohemianFindings sits at the top of the list with more than one-thousand sales the previous day. Looking at the BohemianFindings shop on Etsy we can see that most of the items listed there sell for about $2.50. This shop has more than four hundred pages of items listed to sell, so some items will be more, some will be less. However, if we consider the shop’s average sale to be $2.50, that means BohemianFindings made about $2,640 in sales the previous day. Not bad! Don't forget though, you still have to count things like cost of products to purchase, packing and shipping costs, plus labor. I highly doubt they're selling over 2k items per day without a paid staff. The shop in tenth place for the day, MayaHoney, had one-hundred sixty-five sales. You can visit the shop on Etsy and see that their items are roughly the same price ($2.50) as the shop in first place, Bohemianfindings. That means the MayaHoney shop made about $400 in sales for the previous day. Again, not bad. There is another Etsy shop I want to call your attention to: ThreeBirdNest. ThreeBirdNest is an Etsy shop that has received lots of coverage online, and in traditional media. 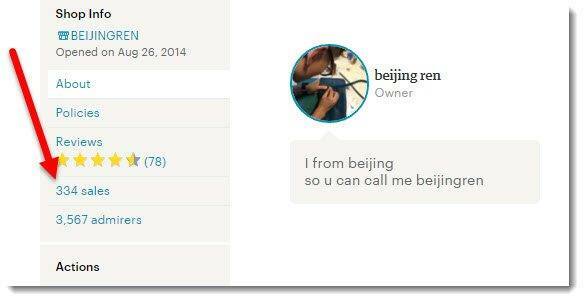 The ThreeBirdNest shop has reportedly made more than $60,000 per month some months. Keep in mind that everyone's margins are going to be different, so that doesn't necessarily mean that the top sellers are making more and the other sellers shipping fewer products are making less. After reading this far you are probably ready go all in with Etsy, but let me explain why that is probably a bad idea. The first thing you should consider is that all three shops we featured above were not instant successes. They all started at roughly the same time. They had to work for years before they saw any success at all. This is true for most businesses, but just I just mean to temper expectations here. In fact, Alicia, owner of ThreeBirdsNest, claimed to have only made ninety sales in her first couple years on Etsy. With almost one-million shops on Etsy, competition is fierce, and certainly not ideal for anyone hoping to jump in and make a lot of money right away. Please consider some of these caveats before jumping into the craft biz. Storing items can be a real pain. Most handmade goods require an extensive amount of care. If you make soap, for example, you can’t just make a batch and throw it in your garage for two months waiting for it to sell. Do that, and you could lose your entire inventory, and all your hard work was for nothing. Packaging and shipping items costs money and takes time. When most new businesses start to grow, they usually find that this is their bottleneck. A growing business is a good thing, but if you don’t plan, hire and budget for packing and shipping then any growth you might have seen will be instantly stunted, and probably stopped. With the help of the internet, and places like stamps.com that can allow you to basically ship products from your house, this part of the business is easier and easier. It's still time consuming though, and cannot be ignored! If you like making things, this one isn’t going to bother you all that much. But, if you just like handmade things — talking about, buying them, selling them — then laboring over a handmade craft for hours isn’t going to be appealing. You can jump into the crafts market, and make lots of money without actually making anything. (stay tuned). There is a real difference between making a few cool items and shipping them to happy customers for pocket money, and creating a full time business shipping thousands of hand-made crafts every month. After creating, packing and storing your items, you still have to find time and money to market your business. Etsy does not do this for you. That’s a common misconception. An Etsy shop is part of a marketplace that may or may not come up in the searches shoppers perform while inside Etsy. 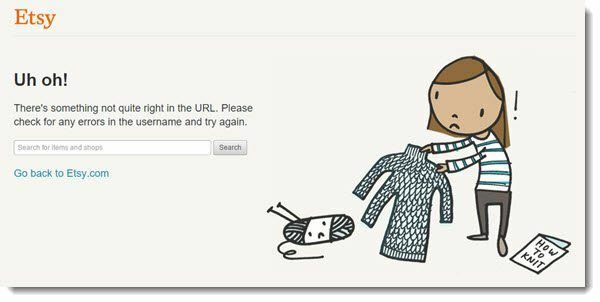 Etsy’s Most Successful Shop Gone? If you have read this far then you probably went to Etsy to check out some of the shops mentioned in this post. I’m willing to bet you to visit one in particular: ThreeBirdsNest. If you did, then you probably noticed the shop no longer exists there. That’s because the Alicia, the owner of ThreeBirdNest, decided to pull her shop from Etsy’s listings! There seems to be some controversy around this topic though. Etsy says they removed the shop from their listings for compliance issues. Alicia says she removed the shop herself after numerous problems with customer support, shipping and other issues regarding her customers’ satisfaction. No matter what the reason, or who did what first, the important thing to note here is that a wildly successful Etsy store was suddenly gone from its listing’s. If she did remove the store from Etsy, she must have had a very good reason, given the success she had there. If Etsy gave her the boot, then that is an even scarier thought. And it brings me to my point. You Don’t Own Your Shop!!! Whether Alicia pulled the store down herself or not, Etsy still made a statement saying they were the ones to remove her. Why does this matter? Well it shows that Etsy has the power to remove any shop at anytime. Imagine building a successful business that was stripped out from under suddenly. Not a good feeling. Unfortunately it happens all the time with sites like Etsy, Facebook, YouTube and countless others. Anytime you build on a platform you don’t own you run the risk of losing it all, at any minute. People — even your competition — can put you out of business with a few simple complaints. This is probably the biggest reason to avoid building a business that relies on a marketplace controlled by a third party. ThreeBirdNest owner, Alicia, says she left Etsy because of issues regarding the satisfaction of her customers. She says they were treated poorly by Etsy support staff, shipped items that were both, late and damaged. This is another major problem with building a business in someone else’s marketplace. Alicia, like every other Etsy shop owner, does not control the customer experience. When you sell on sites like Etsy, they maintain control over everything, including customer contact information and payment details. The hard truth is, every single Etsy shop owner is simply providing more and more customers for Etsy — they are building Etsy’s business, not their own. During negotiations to distribute Wall Street Journal and New York Post in iTunes, Steve Jobs fought with Rupert Murdoch (among other CEOs) about who would collect, maintain — and essentially own — customer information. Steve Jobs believed that anyone who bought through iTunes was Apple’s customer. Rupert Murdoch disagreed, and wanted to collect and keep the information of customers he believed belonged to his company. This power struggle — not over money, but over over payment and contact details — highlights how important this information is to a business. Rupert Murdoch had already agreed to give Apple 30% of their sales through iTunes, and slash the price from $4 to just $1. For him, money was not the problem. Two numbers — credit card and phone — put two of the world's most powerful businessmen in stalemate for more than a year. In case you’re wondering, Murdoch finally submitted to Jobs’ request in 2010, after newspaper sales fell to all time lows. Being a business owner (online or offline) means making smart decisions. Too often, new entrepreneurs jump on what’s easy, cheap or trendy. I urge you to avoid that trap. Make smart decisions that will pay off in the future. If you like to make crafts, that’s great, Etsy isn’t the only game in town. I’m not saying you shouldn’t you open an Etsy shop — if that's what you want — what I am saying is that you have to do more than that. You can open an Etsy shop while also running your business on your own website. For folks serious about making money online, Etsy should be used in addition to all the other things you are doing to grow your business. It should not be the only thing you do. While Etsy boasts being home to more than 800,000 shops, it is rumored that only half of them are active. To be active in Etsy requires selling at least one item within the last twelve months. If you want to make money in the crafts market, why not start out simple? You can start as affiliate and sell crafts from Etsy, Amazon, or any other retailer. Affiliates don’t have to worry about making, shipping or storing items. I’m an affiliate for some of my favorite companies and I enjoy making a percentage of every sale without ever touching a product. You could do the same thing. That doesn’t mean you never get to make your own handmade goods. You can do both. You can start a website for less than $10, become an affiliate for your favorite stores, and build an income that supports you and allows you the time to make your own things. You can always add your own items to your website anytime, or start craft store on Etsy or Handmade at Amazon and link to your mini-shop there. Being an affiliate is the best way to make money online in my opinion. It's cheap to start which means low financial risk. There's no inventory to store, no items to ship, and you have the freedom to grow your business at your own pace. I started back in 2010, and now I do it full time. Like me, you can join Wealthy Affiliate to learn more about becoming a successful affiliate with a free starter membership that includes 24/7 live chat, 1,000s of members — and oh yeah, me! I’ll be there to help you along the way too. Hey quick question! When sales are made through an Etsy affiliate link, does the Etsy seller lose money? Or does the pricing for customer and Etsy-seller remain the same, and only the commission is added by the Affiliate program? I’m not sure! I’ll have to look into this. Thank’s for this article, I’ve been thinking about do selling online for a really long time. And your information made a lot of since. I have a t- shirt ,vinyl banner, and pad printing promotional product business. So for I’ve only some local work for schools, PAT clubs and other nonprofit organizations. I have flipped the switch to go live on the internet. What do you recommend for me as I still have a 9- 5 job. I recommend that you start an online business as recommended in the article above. Anyone can make money doing that as long as you’re willing to spend time doing internet research and writing articles! Thanks for all information about Etsy shop. I am right now doing all the mistakes mentioned in your article! Going ASAP finish my website and start your training course.